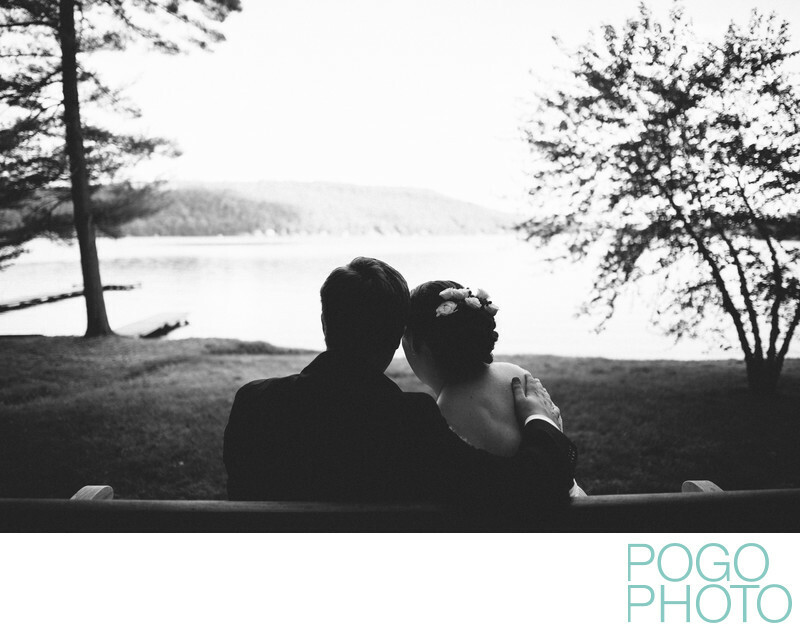 We took this photo of a newly married couple sharing a tender moment on a bench over looking Lake Champlain at All Souls Interfaith Gathering in Shelburne, Vermont. All Souls welcomes people and weddings of all faiths, religions, and beliefs. Taking elements from Christianity, Judaism, and Islam are the just the a few of the belief structures welcome at the beautiful Shelburne venue. The Inspirations from other religions around the world are not limited to recognizable names like Taoism, Hinduism, and Buddhism; spiritual readings also include those from Native Americans tribes and Taoists. All are welcome here all the time and witnessing the blend of spiritual beliefs come together in harmony is appreciated exponentially when compared to certain unharmonious elements of our society and the political system. Approaching its twentieth year of operation, All Souls has become one of the most serene places to host a wedding in Western Vermont. Before entering the building, a winding road leads through two rows of trees, welcoming you with open branches. The arboreal theme continues before reaching the water with a trail through the forest, including a walking labyrinth. The rolling fields in front of All Souls, as well as the sloping lawn leading down to Lake Champlain provide a vast and sweeping background for photography. On partly cloudy days, watching sunlight change as it moves and dances across the undulating landscape also offers the chance to play with light during portrait time. On this relatively cloudless day, the sun reflected strongly off of Lake Champlain, but we chose to use it as a sea of photons and keep our bride and groom snuggling under the trees’ overhanging branches. Shelburne is a peaceful town with one massive tourist attraction right on the main road, the museum bearing the town’s name. Rich in history, the museum also hosts weddings and has become a go-to for destination weddings and locals’ nuptials alike. We love hearing how the area strikes people differently and what draws them to Shelburne, specifically for their most important of days. A quick drive south of Burlington down Route 7, Shelburne is the largest town between Burlington International Airport and the bridge to New York State, making it one of the first settlements where travelers stop to take in the sights, sounds, and aromas of a small Vermont township. We appreciated how welcoming All Souls was in terms of geography, the building itself, and the view from the entire western portion of the acreage, but the warmth and openness of the staff truly completed the soothing, calming experience. We visited All Souls Interfaith Gathering before ever being hired as a photographer for an event there and it instantly became one of our favorite places in an area chock full of magnificence. We look forward to returning soon and always end up smiling immediately when an inquiry comes in from potential clients who see the appeal of the place in the same way we do. All Souls Interfaith Gathering is an ideal location for a wedding celebration; we hope you consider it for your ceremony and take a few moments to breathe in the peaceful nature of the location when you visit. Location: All Souls Interfaith Gathering, 291 Bostwick Rd, Shelburne, VT 05482. 1/2000; f/2.0; ISO 320; 24.0 mm.